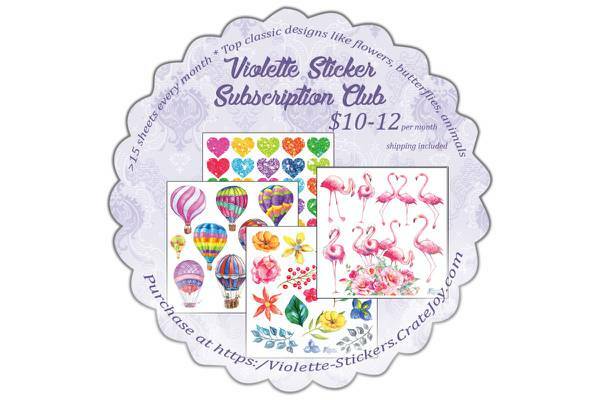 Enter your email address below to receive a notification when Violette Sticker Club starts accepting new sign-ups! Enter your email address below to receive a notification when Violette Sticker Club is accepting new sign-ups again. Stickers packets will be mailed out near the 25th of each month via first class US mail. Subscriptions renew on the 11th of each month. 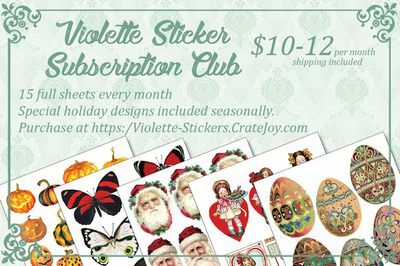 Subscription cutoff is the last day of the month to receive that month's shipment. 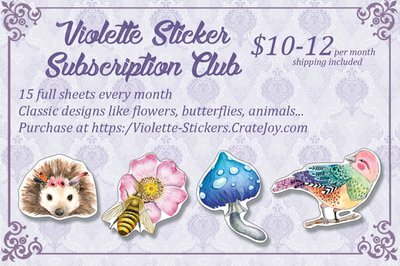 Imagine a lovely set of stickers arriving every month! 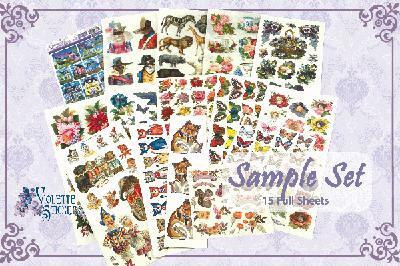 Beautiful florals, butterflies, animals and all types of contemporary artwork. 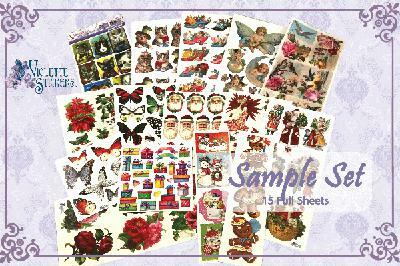 Every month, classic designs combined with brand new releases arrive to impress sticker lovers of any age. 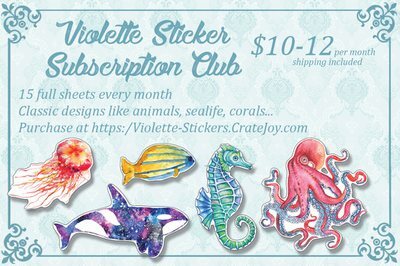 I absolutely loved the stickers but after contacting the company about a missing shipment, I'm sorry to say I've canceled my subscription. 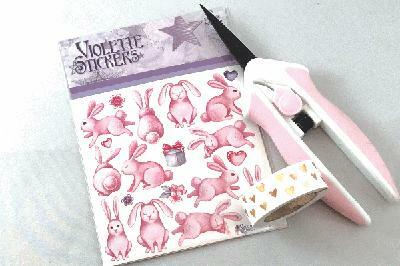 No matter how great their stickers are...I cannot do business with Violette Stickers any longer. They are disorganized and untrustworthy. I was told February's stickers shipped out on the 25th of February but when I hadn't received them by the 10th I contacted the company and was promised that they would be re-shipped that very day. I still don't have them and it's the 24th of March. To make matters worse they charged my debit card for the March sticker order after I told them to cancel my subscription. 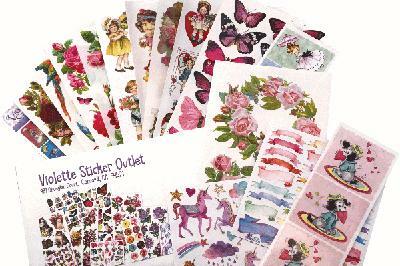 I've had email correspondence with Teresa Castle of Violette Stickers but she just told me to be patient, the stickers are coming and I should know it takes a long time to get to the UK from their location in California! Ironically, I'm not in the UK, never have been, in fact I'm also in California less than 150 miles from the Violette Stickers business office. 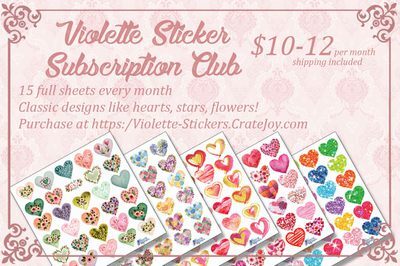 I don't want any business like Violette Stickers having access to my bank account so that's why I had to cancel and it's really too bad because I loved their stickers. I keep getting these delivered to the wrong address. I was told to update my adddress, but when logging in it said I had no address here or subscriptions. The stickers are beautiful (as many others have said). 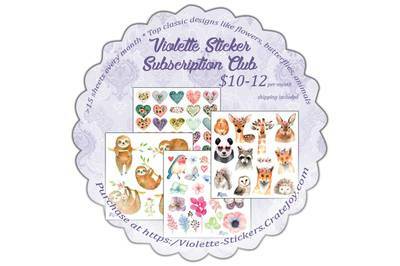 What I like about this subscription - unlike other, more well-known sticker kits (not planner-specific sticker kits) - some of Violette's stickers are made by them. 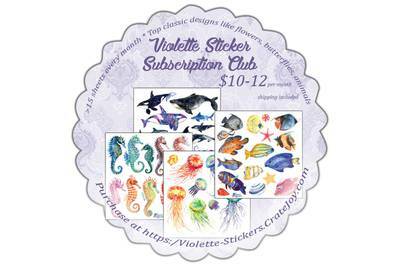 So no one is going out and buying a bunch of generic stickers from various companies & that is all you get .... no, you get several with the Violette name on them. I am very happy to support someone's art - which is what this is, whether it sticks to something or not.